After witnessing the full power of Quebec’s student unions at the Grand Prix demonstrations in early June, I returned to Montreal this week for what I expected to be intense manifestations supporting the continuation of strike through the fall semester. However, the confluence of Quebec’s Liberal Party Premier Jean Charest’s call for a September 4 election, heavy pressure from college administrations, and the exhaustion of many striking students led to a sweep of votes by Montreal’s CÉGEPs (junior colleges) to return to class. While certain university departments may continue to strike, the loss of the CÉGEPs, particularly the reversal of strike votes at two influential CÉGEPs, was a huge blow and will significantly alter the student movement this fall — and other youth movements looking to Montreal for inspiration. Early in the week, the CÉGEPs were coming out split, initially with two CÉGEPs —de Saint-Laurent and du Vieux-Montréal — voting to continue strike, and two opting to end the strike. But by Thursday, a half dozen other junior colleges decided to return to school and it was clear the tide had changed. CÉGEP du Vieux-Montréal had voted on Monday to continue the strike by a narrow vote of 879 to 861, and after the loss of other CÉGEPs’ support, students petitioned for a re-vote on Friday, a process that also occurred at CÉGEP de Saint-Laurent. On Friday, I visited both campuses. At CÉGEP de Saint-Laurent, a small cluster of students who had traveled from Ontario for what they expected to be an enforcement of a strike (to block students from returning to classes) agitated meekly on the school’s lawn. 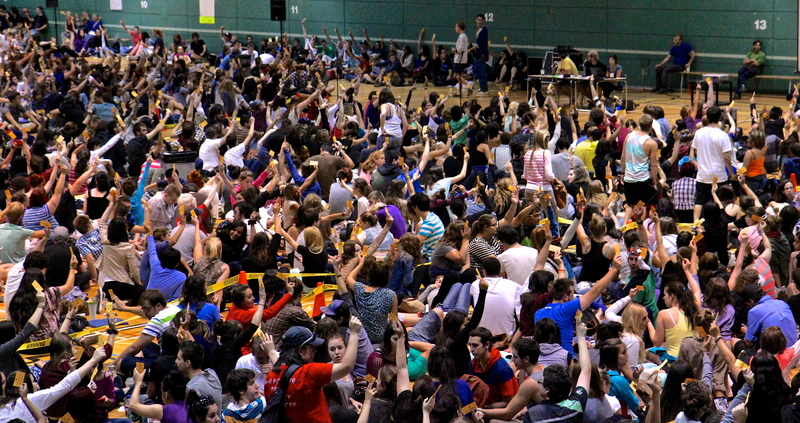 At CÉGEP du Vieux-Montréal, I witnessed the General Assembly in the school’s gymnasium from the stands, where young people gathered as spectators for the pivotal meeting. While I was kicked out (they voted no media, and while it’s not my primary identification, one has to respect the GA) long before the near six hours of deliberation would yield the decision to end the strike, it was obvious that the mood of the assembly was sullen. The junior college du Vieux-Montréal has symbolic significance, known as one of the most radical campuses in North America. In February this year, students barricaded themselves on the front steps of the building and vandalized the inside to protest tuition hikes, leading to thirty-seven arrests. 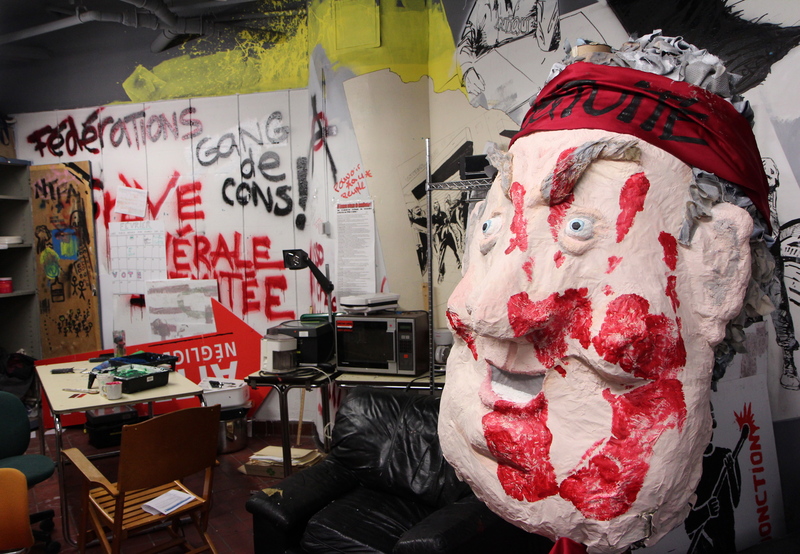 Each room in the CÉGEP is “historic” for radical student movements as one student told me. While students chose to relent, it’s important to understand the pressure they were facing from administrations. At some schools, administrations threatened arrest and failing grades for all students who voted to continue striking, citing Montreal’s latest repressive statute, Law 12, which imposes heavy punishment for hindering access to any public institution. Schools also sent emails to students telling them to return to class without informing student associations. At CÉGEP de Lionel-Groulx, eleven teachers were threatened with firings for publishing an open letter condemning violence against students at the college. It’s a discouraging week, but many remain hopeful and turn their attention towards the action on the 22nd (the anniversary demonstration), the increasing support from students outside the province and country, and holding parties accountable (or preparing for resuming the strike later in the semester). But more than anything, students discussed the upcoming election. Of the five parties running, only two — Option Nationale and Québec Solidaire — are clearly against rising tuitions. For now, Parti Quebecois is leading, which would oust the hated Jean Charest and his Liberal Party, but only promises a temporary tuition freeze and a vague renegotiation process with students. Furthermore, many students resent the PQ for its opportunism, particularly the party’s leader Pauline Marois’ “shrinking” red square (the party originally endorsed the student strike and its symbol of the red square, but as it changed its position, Marois ditched the pinned red patch). Others are disconcerted by the rise of Coalition Avenir Québec (CAQ), a strongly right wing party. Because of Quebec’s parliamentary system, the projected election results would mean a PQ minority government, which has very limited power. American students continue to look towards Quebec, now particularly for how it will deal with an election where votes can be viewed as strategic, ideological, or irrelevant. The rise of students emphatically professing positions like not voting to delegitimate the electoral system may change the discourse on American youth voting. But more likely, American students will be looking to see if Montreal students have really built power, so that they can muster up force if the seated party does not uphold its promises. ← Student Unionism, Why Don’t American Students Strike?